Many of us take the ability to speak clearly and properly for granted. In order to be an effective political leader, one must be a strong speaker. In a monarchy where positions of power are inherited, there’s the potential for an unwelcome character trait, such as shyness compounded by a speech impediment, to throw everything off. The King’s Speech tells the poignant and heartwarming true story of King George VI, the King of England during World War II. He struggled to speak through a debilitating stammer, but as he found his voice, he gave hope to an empire in one of its darkest hours. The King’s Speech is as quiet and strong as the Royal Family itself, and it is undoubtedly one of the best films of the year. The film’s opening is as awkward and heartbreaking as any I can remember. The Duke of York (Colin Firth) stands before a crowded exhibition at Wembley Stadium, 1925. He steps to the microphone and freezes up, failing to deliver his words properly. His stammered speech echoes endlessly through the stadium. His wife (Helena Bonham Carter) accompanies him as he visits many speech therapists, none of whom prove effective. As a last resort, she seeks the help of Lionel Logue (Geoffrey Rush), a speech therapist with unorthodox methods. Lionel works with the Duke, who he calls “Bertie,” for over a decade. When the Duke’s brother abdicates the throne, the Duke of York inherits the crown, a looming war, and an empire in need of a reassuring voice. Colin Firth has been a splendid, much-loved actor for many years, but the time has certainly come for award recognition. 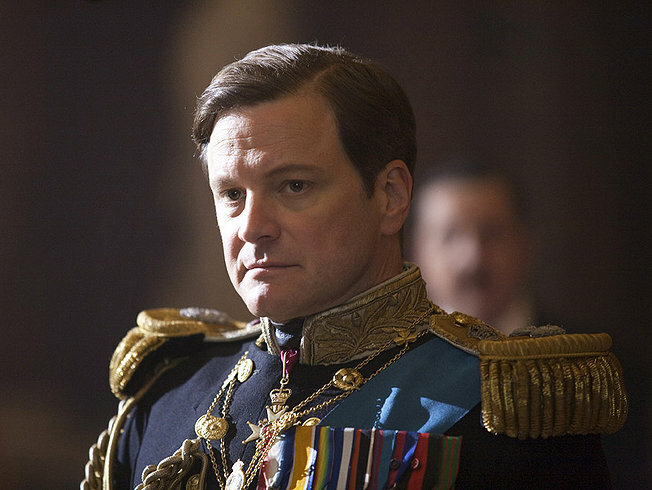 His performance as George VI is understated and completely believable. His stammer isn’t overdone but is a fluid part of a rounded performance. I genuinely felt sorry for him every time he was forced to speak publicly. As strong as Firth is, Geoffrey Rush nearly steals the show as the therapist who is unwilling to make exceptions for his royal patient. Again, the performance is powerful but restrained and believable throughout. I forgot I was watching actors. The supporting cast, screenplay, director, and picture could all win Oscars as far as I’m concerned, but Colin Firth’s performance must be recognized. Many movies based on inspiring true stories try to be inspiring much too soon. Strong music and telling shots early on can tip a film’s hand and make it all a bit too cheesy. 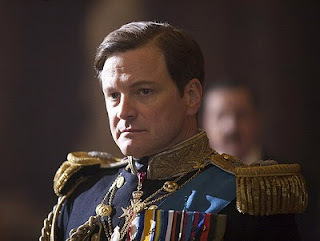 The King’s Speech doesn’t utilize the common cinema “tells” for when an inspiring true story is in the works. Even at its most triumphant moments, the film maintains a quiet dignity, moving at a tone and pace appropriate for Britain’s reserved Royal Family. The film covers 14 years in two hours, but the script mixes tension, joy, sadness, and humor in just the right amounts so that the overall experience evokes real life. The dialogue is superbly crafted and consistently charming. The King of England is by nature a very public figure, but while The King’s Speech revolves around public figures and public events, the triumphant story is deeply personal. One-on-one relationships are the main focus here: George and his wife, George and his brother, George and his father, and most of all, George and his therapist. The scene that still resonates in my mind days after seeing the movie involves an argument between Lionel and “Bertie” on the eve of the coronation. As the argument heats up in Westminster Abbey, the King finds all of the confidence he needs. It’s an honest, unexpected exchange that makes for one of the year’s most memorable moments. Watching footage of Adolf Hitler, the king’s young daughter asks, “What’s he saying, Daddy?” “I don’t know,” he tells her, “but he seems to be saying it rather well.” George VI understood that the true power of the King of England was the ability to inspire his people, and the story of how he learned to do so is one of the year’s great moviegoing surprises. Word of mouth is spreading like wildfire on this picture; my wife and I were turned away from a sold-out showing and had to return the next day. At the film’s end, the audience cheered and rightfully so. 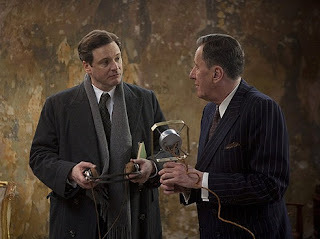 The King’s Speech is an inspiring story, a great drama, and one of the finest films of 2010. I think the MPAA got this one wrong. Yes, I know the rule about how many “F words” constitute an R rating, but the language here is concentrated in two or three scenes, and it’s used exclusively for comedic purposes. The King spouts profanity in an effort to enunciate properly and calm his nerves with hilarious results. There’s nothing sinister or mean spirited about this picture. If it were up to me, I’d switch this movie’s R rating and True Grit’s PG-13 in a heartbeat. The Coen Brothers’ True Grit isn’t a remake of the John Wayne classic (1969) but rather a second film adaptation of the 1968 novel. I haven’t read the novel, though I’m told that this latest version adheres more closely to it. Regardless, I can tell you that True Grit is aptly named. Rooster Cogburn (Jeff Bridges) has true grit, the dialogue has grit, the violence has grit, and lead character Mattie Ross (played by 13 year-old Hailee Steinfeld) has more grit than any of ‘em. Mattie Ross seeks justice against Tom Chaney (Josh Brolin), the man who killed her father. She hires U.S. Marshall Rooster Cogburn after hearing of his ruthlessness. Texas Ranger LaBoeuf (Matt Damon) tags along as he has already been tracking Chaney for other crimes. The unlikely trio heads into uncharted Indian Country (modern-day Oklahoma) in pursuit of Chaney, and the mission quickly turns dangerous with rugged terrain, harsh weather, and a plethora of gunfights. When John Wayne played Rooster Cogburn in 1969, he had his entire career and image behind him. We believed he was a weathered, tough cowboy because he was John Wayne, and we had seen his previous work. Jeff Bridges isn’t usually associated with tough-guy roles, but he sells his role in True Grit with gusto. He walks and talks like a drunk, mumbling his lines and pulling his gun out over minor disputes. He makes Rooster Cogburn his own, which is about all you can do when someone like John Wayne has played (and won an Oscar for) the same role previously. All other performances are strong, especially Hailee Steinfeld as the lead. A lesser actress would have overplayed the part into caricature, but Steinfeld is believably spirited and tough, and she holds her own in the company of established talents. The dialogue is purposeful and engaging, as is all Coen Brothers dialogue. The first half hour is composed almost entirely of character work, but once the characters hit the trail, the true grit begins. Every so often, a quick burst of intense violence will make you wish you had looked away. There isn’t a whole lot of violence in the movie, but what little there is doesn’t leave much to the imagination. Usually, the movie gives you a two-to-three second warning before gunshot wounds, stabbings, and other such unpleasantries appear. At its core, True Grit is a simple western, and it’s done very well. The Coens have made a traditional, rough-around-the-edges cowboy picture, and it would appeal to just about anyone who enjoys the western genre. It isn’t nearly as eccentric as most Coen movies, but the often humorous dialogue and memorable side characters carry the mark of Joel and Ethan’s writing and directing. I admire the Coens for their obvious devotion to the source material and to the genre, as well as for knowing better than to try and fix what’s not broken. True Grit doesn’t bring a whole lot of innovation to the table, but that’s a good thing. To be honest, I was floored to learn (after seeing the movie) that True Grit is rated PG-13. Read the MPAA’s content warning; does that sound like a PG-13 movie to you? It’s very intense, including gunshot wounds to the head, knifes to the chest, and most memorably, severed fingers. No, I’m not talking about implied violence; I mean you actually see a knife blade sever a man’s fingers. As far as taking your kids goes, I would treat this more like an R-rated movie. It’s pretty rough at times.